An edge-colored cycle is rainbow if its edges are colored with distinct colors. A Gallai (multi)graph is a simple, complete, edge-colored (multi)graph lacking rainbow triangles. As has been previously shown for Gallai graphs, we show that Gallai multigraphs admit a simple iterative construction. We then use this structure to prove Ramsey-type results within Gallai colorings. 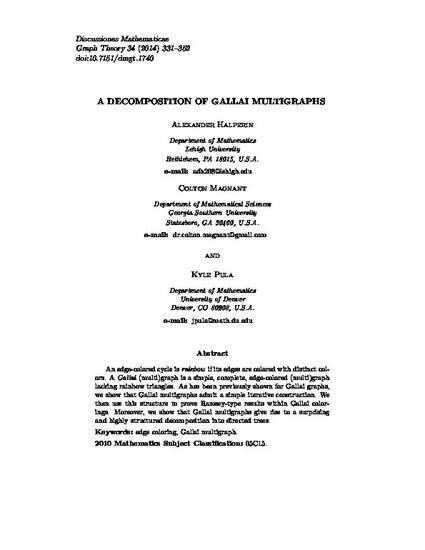 Moreover, we show that Gallai multigraphs give rise to a surprising and highly structured decomposition into directed trees. This article is under the http://creativecommons.org/licenses/by-nc-nd/3.0/. Article obtained from Discussiones Mathematicae Graph Theory.